Go eco-friendly with your windows and save €€€s! According to SEAI, the most likely cause of heat loss in your home is through inefficient double glazing? Upgrading your glass to the latest E-Glass Plus™ or E-Glass Ultra™ will significantly reduce heat loss through your windows. Upgrading to E-Glass will save you Hundreds of €€€€ per annum! Warm Edge Spacer Technology – 1,000 times more thermal insulation than aluminium spacer bars- many different colours available. True Reflection – Some Toughened glass can appear distorted but not our double glazed panels! Ideal for large Picture Windows. The infographic below shows how our energy glass Double Glazing works. As you can see, the heat from the sun is allowed to pass through the glass into your house, whilst the heat from internal radiators cannot. Due to the low E coating, the heat from the radiators bounces back into the room. All the heat stays trapped inside your home. You are no longer throwing money out of the window! E-Glass Plus™ or E-Glass Ultra™ can be fitted throughout your home in just one day, and it’s clear to see that the benefits will last you and your home for a very long time. We can provide testimonials from many of our happy customers, as they have been astonished by the benefits. The blue colour shows that no heat is being lost – this is because the windows upstairs have been upgraded to Low-E glass, unlike the downstairs windows which are still losing a significant amount of heat. 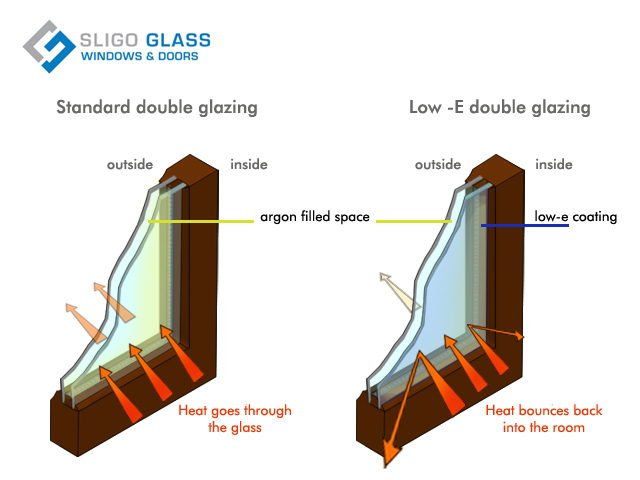 The infographic below shows the difference between E-Glass & Standard double glazing. If you are interested in upgrading your glass to E-Glass Plus™ or E-Glass Ultra™, or you want to hear more about our services, please don’t hesitate to get in touch – we’d be more than happy to help! We offer a 5-year warranty on manufactured products. 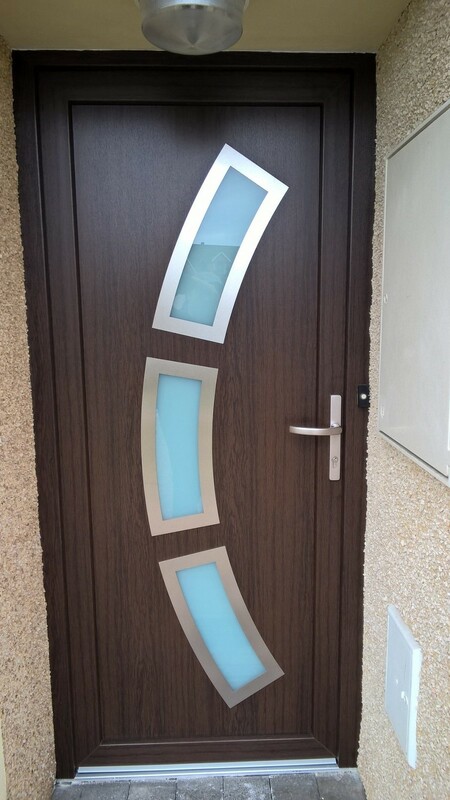 If Upgrading your Glass …Why Not Upgrade your Doors to the latest Continental style Doors.